After three years of waiting, the 2017 Infiniti Q60 coupe is all-new. 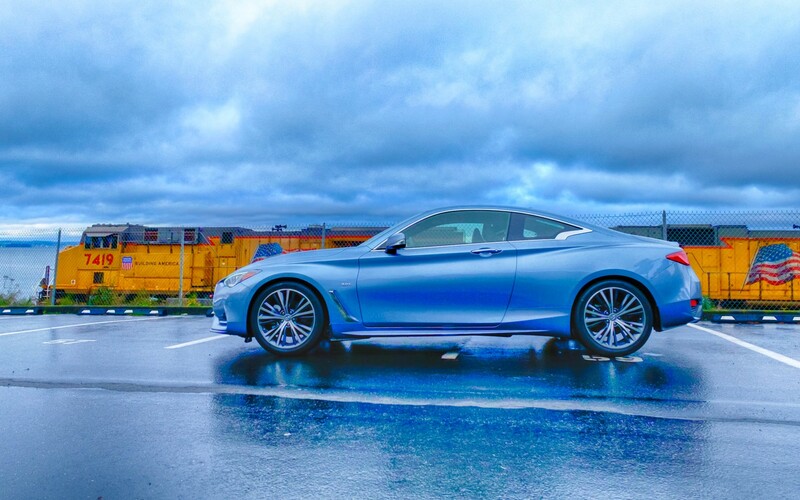 Unlike the Q50, which was an all-new replacement for the G37 sedan for the 2014 model year, the G37 coupe soldiered on for three additional years with a new name – Q60. Fortunately, the 2017 Infiniti Q60 is an all-new halo car this year with gorgeous exterior styling and a new modern tech-focused interior that’s shared with it’s four-door brethren. The new look is unmistakably Infiniti, but sculpted with more body bulges, sleeker headlights, taillights and a large in-your-face grille. The headliner for the new 2017 Infiniti Q60 is the powertrain – a 3.0-liter twin turbocharged and direct injected V6 engine. Dubbed the VR30DDTT, the new force-fed mil is derived from the VR38DETT that powers Godzilla, also known as the Nissan GT-R, and replaces the 3.7-liter VQ37VHR. While the outgoing VQ37VHR produced up to 330 hp and 270 lb-ft, the new VR30DDTT has 300 hp and 400 hp variants. My fellow colleague Nik Miles drove the 400 hp 2017 Infiniti Q60 Red Sport last October, but my interest is with the middle-of-the-road 300 hp version. 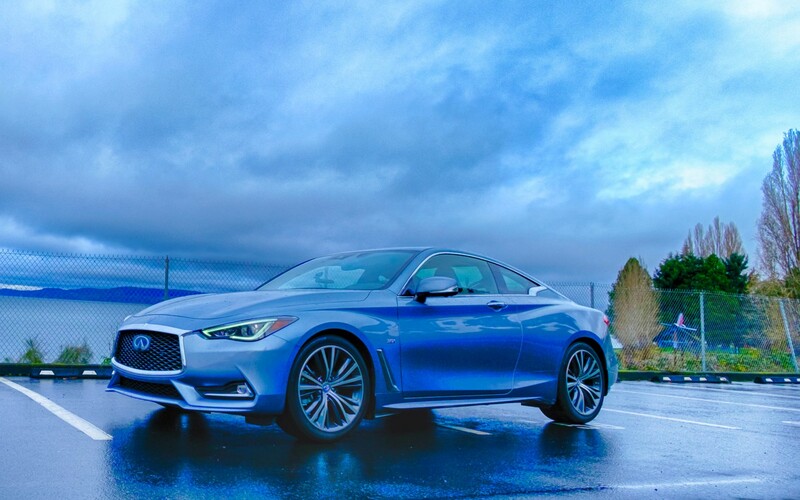 To get a taste for the 300 hp VR30DDTT engine, I spent a week with a 2017 Infiniti Q60 3.0t Premium equipped with the technology package, direct adaptive steering, driver assistance package and premium plus package that brought the MSRP to $55,255. It’s easy to get excited over the Q60 Red Sport and it’s high output VR30DDTT rated for 400 hp, but things aren’t always what they seem on paper. Infiniti claims the standard VR30DDTT officially produces 300 hp and 295 lb-ft, but things aren’t always what they seem. 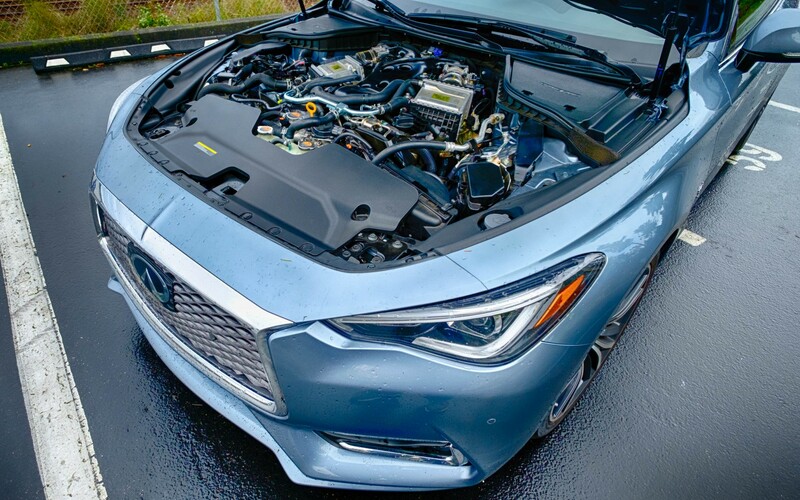 To find out what secrets are hidden behind the regular VR30DDTT, I stopped by Drift-Office in Auburn, Wash. to put the 2017 Infiniti Q60 3.0t Premium on the vehicle dyno to test its power output at the wheels. Drift-Office is a tuning shop that specializes in ECU tuning for cars like the Subaru BRZ, WRX, Scion FR-S, Nissan 350Z/370Z, Infiniti G35/G37 and many others. After three runs on the dyno, the 2017 Infiniti Q60 3.0t Premium revealed its 300 hp rating is quite conservative. The VR30DDTT produced 310 hp and 325 lb-ft at the wheels, which is a little higher than what Infiniti rates it at the crank. You see, manufacturers typically rate engine power by what it produces at the flywheel before the transmission is attached. If you take the typical 15-25-percent loss due to the transmission and sending power to the rear wheels, we’re looking at around 345-375 hp at the crank, which isn’t too far off from the high output Red Sport’s 400 hp rating. Additionally, the dual water-to-air charge coolers do a fantastic job at cooling the engine and intercoolers. The engine bay remained cool and the intercoolers warm to touch after three dyno runs – heat soak wasn’t an issue with the VR30DDTT. Now if you’re a car enthusiast like me, you’re probably wondering how much more power you can get out of the VR30DDTT with bolt-ons and an ECU reflash. Ecutek, the tuning software used by Drift-Office for most Nissan and Infiniti vehicles does not support the 2017 Infiniti Q60 yet, unfortunately. But there’s good news because Ecutek can detect the ECU, it’s the same one used in the Q50, Q60/G37 and 370Z, so the potential is there. You might have to wait a little while before Ecutek adds support for the Q60, but the car only went on sale in September. 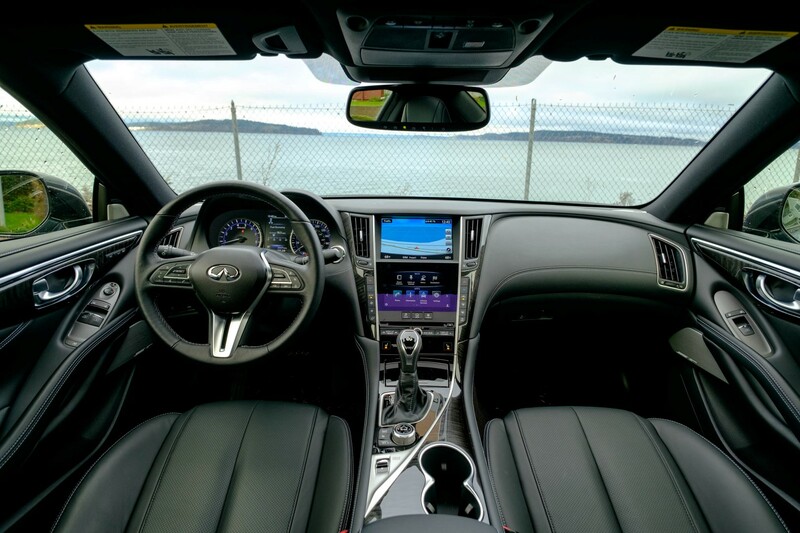 The 2017 Infiniti Q60 3.0t Premium I drove had the optional direct adaptive steering (DAS), which eliminates a mechanical link between the steering wheel and steering system. A mechanical fail-safe is still available as a safety precaution in case there’s a problem, but the car’s computers read steering wheel input as 1’s and 0’s instead of a good ole fashion direct-connected metal steering shaft. Infiniti’s second-generation DAS is a substantial improvement over the first-generation system that debuted with the Q50, but it’s not quite there yet. It’s more precise with hints of road feel, but feels artificial and vague at times. Steering the 2017 Infiniti Q60 feels more like playing Project Cars with a really good force-feedback steering wheel – it does the job but doesn’t quite feel like the real deal. It’s not as obvious when cruising around town, but there’s a lack of road feel when you’re spiritedly enjoying windy roads. Unfortunately, DAS is a requirement if you want the optional technology package that includes adaptive cruise control (ACC), lane departure prevention (LDP) and active lane control (ALC), which lets the 2017 Infiniti Q60 steer and stop the car when engaged. I’m a big fan of ACC and the system in the 2017 Infiniti Q60 can take the car to a complete stop. I’m usually a big fan of steering assist systems, if they work well. The steering assist system in the Q60 isn’t very good and I found myself fighting it to keep the car in the lane through sections of I-5. The Q60’s system preferred to drive closely to the right lane marker instead of centering the car, which I found extremely unnerving when there’s a semi-truck in the adjacent lane. Infiniti lets the driver choose the level of intervention, but I couldn’t find one that suited me and simply turned it off completely. The driver assistance package that includes forward emergency braking with pedestrian detection, forward collision warning, rain sensing wipers, Around View Monitor (AVM) 360-degree camera, blind spot warning (BSW) and backup collision intervention systems does not require DAS. Infiniti charges $2,250 for the package, but AVM and BSW are two features I absolutely love. 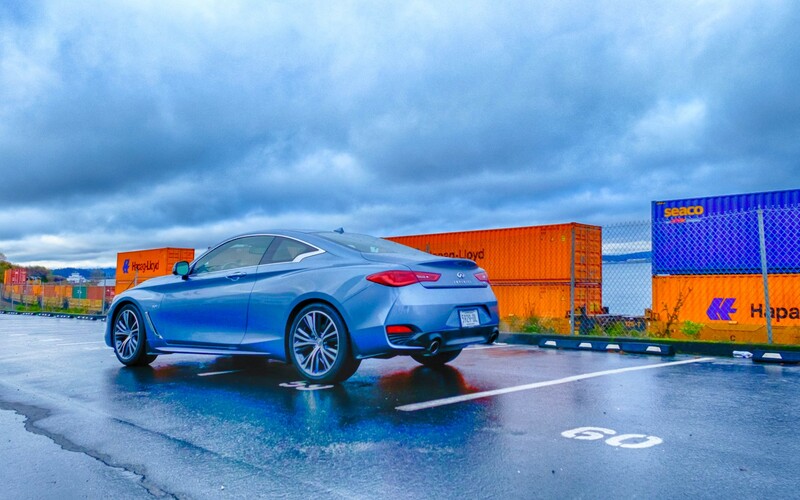 Forget having an automatic parallel parking system, a 360-degree view of the car is all I need to parallel park the Q60. BSW is a nice feature to have when driving at night and in the rain. I tend to come across cars that don’t have headlights on or have one burnt out, which makes them difficult to spot in visibility-challenged driving conditions. BSW systems provide that extra eye on the road that could prevent a potential collision. Infiniti continues to stick with it’s InTouch dual-screen infotainment system in the 2017 Q60, but I’ve gotten the hang of it. I found the system extremely unintuitive and frustrating when I first came across InTouch in the 2014 Q50, but the Q60 is my third rodeo with it and I’ve become accustomed to it. 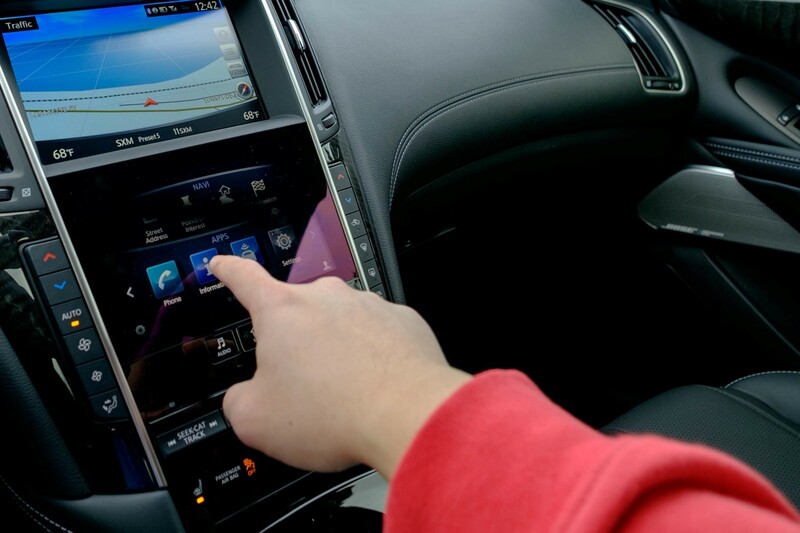 The biggest annoyance is the top LCD screen is controlled by a control knob placed below the shifter while all other functionality focuses around the touchscreen. I found that if I ignore the top screen and leave it on the navigation maps and only use the touch screen, the system becomes less frustrating. The shifter even makes nice wrist rest when the car is in drive to make the touch screen comfortably usable. You can control the navigation system functions through the touchscreen, so you’re not losing much by not relying on the control knob. Functionality of InTouch is pretty standard, with USB, Bluetooth connectivity, SiriusXM, HD Radio and navigation. The navigation maps aren’t up to par with the detailed 3D maps Audi, BMW and Mercedes-Benz employ, but they do the job. 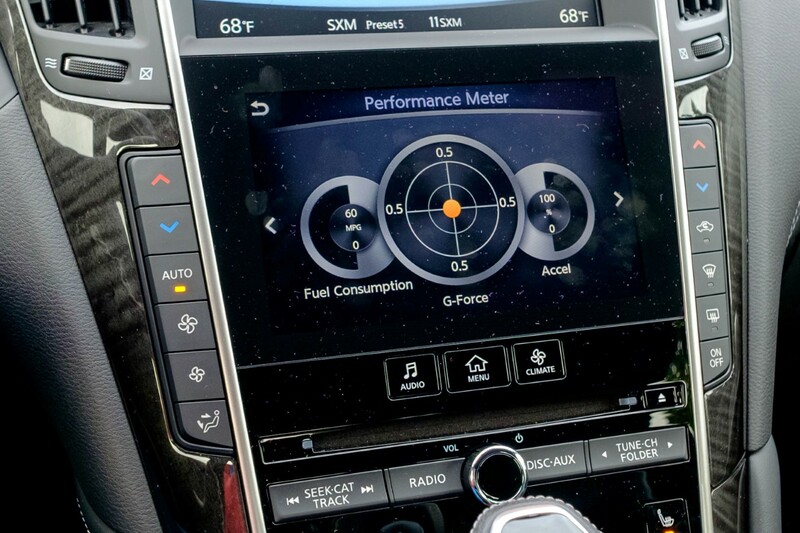 Infiniti includes a performance meter app that adds a couple digital gauges to display the Q60’s G-Force, acceleration and fuel economy information, which is a nice addition. However, there isn’t a boost gauge, which seems like an odd oversight on a twin turbocharged car. At $55,255, the Infiniti Q60 3.0t Premium is aiming straight for the BMW 4-series, Audi A4, Lexus IS and Mercedes-Benz C-Class. The Q60 definitely has the style and powertrain to compete against the Germans and Lexus, but it’s the cut corners that bother me. While it’s quartet of competitors employ electronic parking brakes, Infiniti sticks to a foot pedal that’s from the Nissan parts bin. Everything from the Nissan Versa to the Titan XD have the same foot-brake. It’s overhead console is the identical to every other Nissan as well. The little details ruin an otherwise high-quality interior and shows Infiniti still needs to work on polish. I can forgive the overhead console, but the foot-operated parking brake is unacceptable, especially when the early model Nissan Leaf’s had an electronic parking brake for significantly less money. Infiniti’s new VR30DDTT motor is an underrated gem that offers smooth power while the seven-speed automatic is tuned for a comfortable cruise. But if I were to buy a 2017 Infiniti Q60, it’d be the 3.0t Sport, which gets all the Red Sport goodies like sport-tuned suspension, sport seats and bigger brakes, but slightly less power. Add the premium and driver assistance packages and you’re at $52,800, which is significantly less than a comparable BMW 340i M-Sport. Was the dyno performed using 93 Octane? 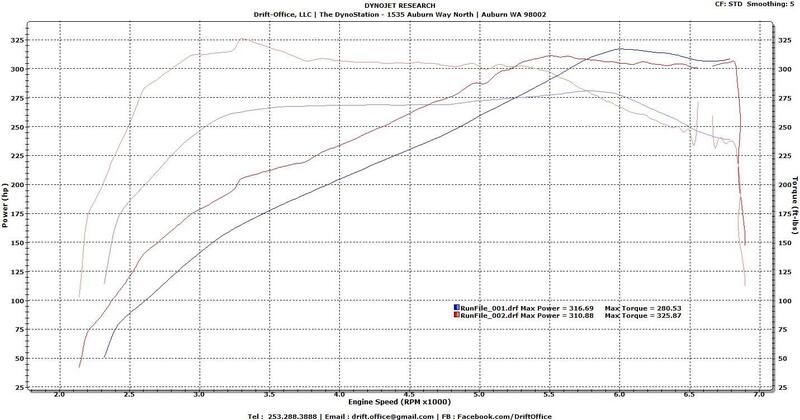 Current dynos, I assume, performed in Cali, are showing ~303whp and ~306 lb-ft/tq to the wheels. If I remember correctly, Cali’s highest octane for public consumption is 91. 310/325 is very impressive power output and Infiniti should be ashamed for underrating this engine by that much (jk) :). I didn’t fill it up – the press fleet management company Page One does, and they typically top it off with whatever gas station near my house, which is typically 92 octane for premium. Ok…that’s insane. Likely 92. That’s is a significant result from what those guys down in Cali are getting. Must be some additional variable other than the higher octane…possibly cooler weather, and the fact that no two dynos are likely to get the same result.